A number of publications are also published in English, digitally and online. The English publications are a translation from the published Dutch books. Here you will find the English version of the book Sema. A few volunteers from Het Talenhuis have taken care of the English translation, led by Piety de Vries. All those who have contributed to the English translation are thanked, especially Patrick Veenstra and Sven de Haan. To thank Piety de Vries as well, her preface is included in this book, mentioning her name as the translator. The dervish dance is a whirling dance that visually expresses the mystical way, from releasing the resistance to cherishing everything. The dervish dance comes from the tradition of Sufism. Dancing dervishes rotate around their axis. Each step symbolizes the reverse, back to connectedness within our infinite self. Sema or ‘spinning dance’ is the name of the Sufi ceremony that got acknowledged through Rumi, and after Rumi’s death his name became associated with Sema. Sema refers to multiple meanings such as listening, paying attention to, giving ear to, a statement that has been heard, a good reputation and a memento. Before I volunteered for Het Talenhuis (literal translation; The House of Languages), I had never heard of a dervish or dervish dance before. When this was explained to me, I thought it was a rather strange idea for a dance. But when I got to see some videos and listened to some stories about this dance, I began to understand why this dance is so unique. When I got the opportunity to translate this book from the original Dutch to English, I learned so much about the dervish dance. The passion and energy these people have for this dance is great. Some even gave up all their belongings for Sema. These people did exactly where Sema stands for. I also got the chance to see someone perform this dervish dance and I have so much respect for the people who put so many hours and energy into this. It is amazing to see how much love and passion they have for Sema. 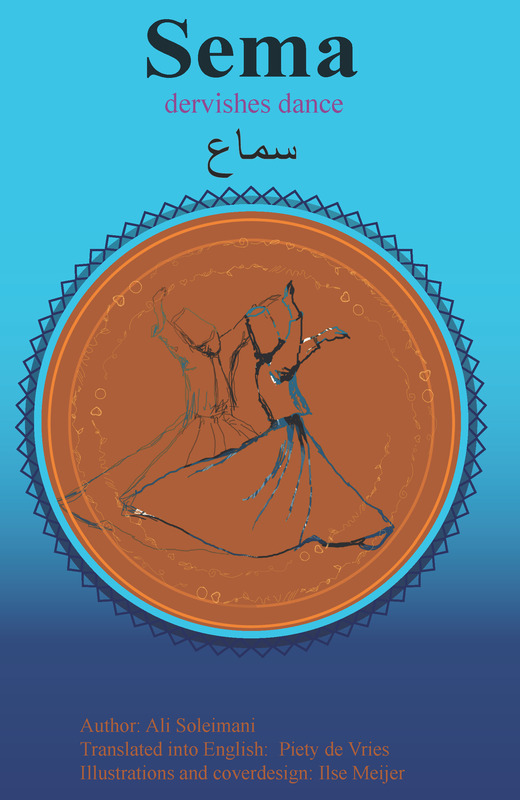 I would like to thank the author of this book, Ali Soleimani, for giving me the opportunity to translate this book, as well as anyone else who contributed with the translation of Sema dervish dance. Many roads lead to Rome but the dervish dance is a direct path: no detours, no step outside their spot, but still so much movement! There is a party going on. Nobody knows when this party has started nor when it’s ending. But that a party is going on, can not be denied. Everyone is brought to this party at any given time and everyone will also be removed from the party at some point. This is known to everyone and everyone knows this. They become foolish from the first moment that they notice that their participation to this party is only temporary and they will be removed. So, everyone that joins this party is a fool. It is actually the party of the fools. The team of bouncers continuously removes partygoers whose time has come. This happens while the party goes strong. The new partygoers are brought in and the bouncers remove the previous ones. There is no set time for participation: some stay longer than others. You become foolish by the knowledge that the party could end for you at any moment and that you could be removed. Some people call this knowledge the big secret of existence. Whoever does anything, does this to make the foolishness somewhat bearable. One lets himself submerge in a sea of wine and the other surrenders to work, day and night, seven days a week. Some put the prophet’s mantle on, others even say that they are god, that they are the truth and… Everyone does something, and sometimes nothing at all, to think the least possible about the removal from the party. A lot of so-called mystici call this knowledge the secret of existence and the meaning of life. Whoever deciphers this secret is not allowed to publish it. Years ago one or more persons have already chosen to make the truth “You will be removed from the party soon” somewhat tolerable by means of spinning. I have not followed a particular order during the writing of this writing. Moreover I have tried not to try. The order of the papers is pure coincidence and not academical, neat and tidy. In this writing terms are used which have a completely deviating meaning for others, expert or no expert. For example the word ‘sema’and the word ‘derwisj’ (darwish; darvish). Sema is here an objective as well as a subjective subject. Sema is nothing else than just a physical and at the same time mental exercise that can be performed by everyone at every age. Things that are so-called spiritual, mystical, something unexplainable or belong to something different, play no role in this. Sema consists of sportive dancemoves with both feet on the ground. Sema is not a ritual and is accessible for everyone, without restrictions. A derwisj is a person who performs sema. No spiritual and/or mystical character is assigned to a derwisj. The derwisj is a person that tries his best to spend his daily life full of joy, as far as possible. A derwisj is everyone who tries to live inside a safe world build on three foundations: reality, morality and responsibility. For a large part, my memory has been used as a source and reference during the composition of these papers. Some specific things came from the internet. All things that are described in this writing can be interpretated and practiced differently. For example: when it is suggested to take three steps or spin three times, people could spin two or four times instead. The suggested things are absolutely no command and have nothing to do with spirituality, mysticism or something like that. At the end of this writing, the ode ‘You and I’ from Rumi will be displayed as a blessing. Finally I would like to show my appreciation and thanks to everyone, especially to Marianne Romijn-Ottink, Geeske Brederveld, Claudia Hageman-Cullens, Ilse Meijer and Marike Buitendijk for their contribution to write this in Dutch. This writing is at the same time the farewell song of the writing. The sema literally means listen and everything that belongs to listening. In the jargon of the dervishes, sufis and mystici sema means taking distance from yourself and fusing with the greater existence. The dervishes believe that people enter a state of peace and joy because of the sema. The celebration, or the sema dance, usually takes place on a round floor. The round shape symbolizes the daf instrument, an enlarged tambourine. The daf instrument itself is a symbol of happiness and exuberancy. So, people dance on the rhythm of joy. It usually does not take long before the dance begins. The dance involves only one movement: spinning. Spinning has many different types and variations. Spinning itself symbolizes the movements of planets, stars, the universe and existence. Everything spins. In order to give an example of the meaning of spinning, people say that it reflects the orbiting of planets around the sun. So the dervishes spin around the center of their dancefloor. The dancemaster usually stands in the center. However, many masters choose not to stand there out of modesty. The round shape is also a symbol of infinity. When circling, people will continuously come back to the place they came from and leave behind what they have achieved as well as where they have arrived. There is absolutely no downtime. The sounds of the daf instrument and the flute are the leading sounds of the dance. Sung poems, especially the odes from sufis, have to be added to this. The rubab-instrument, the tambourine and different kinds of sitars are also being used. The drums can not be missed either. The most sung odes are from Rumi. He believed that things that can not be explained in words can be explained in poems instead. A poem will be more understandable for everyone if it coexists with music and dance. Everything in the world, in particular in Konya in Turkey, that nowadays occurs around the sema, or devishes dance, is done to the reading of Rumi. Rumi lived in the thirteenth century. The celebration of the sema happens all year long, especially in the period around the birth-or death date of Rumi. The sema dance is then being danced a couple days in a row. A sema usually starts by reading out poems of Rumi. These poems are being read out in Persian (the language Rumi writes his poems in) as well as in Turkish. After this, people play the flute. The dervishes enter the dancefloor while people play the flute. 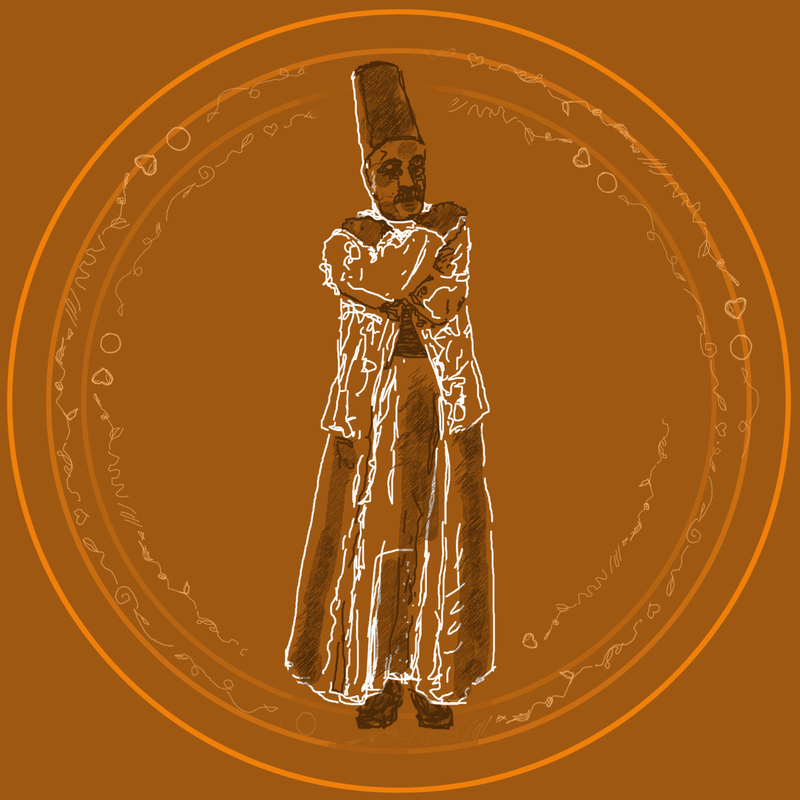 All dervishes wear a black or brown cape (overcoat) and under this they wear a white skirt, white, tight trousers, a white shirt, a black belt and a white, airy jacket. They also wear a high felt hat (headpiece). The danceshoe (footwear) is a leather mule with a high heel, usually of the color black. In general, people can learn how to perform a sema in less than 40 days. a. In the morning, at a fixed time, e.g. at 8 O’clock, make 1 spin. Do not make any speed and spin in a way that does not make you dizzy. b. In the afternoon, at a fixed time, e.g. at 13 O’clock, make 1 spin. Do not make any speed and spin in a way that does not make you dizzy. c. In the evening, at a fixed time, e.g. at 21 O’clock, make 1 spin. Do not make any speed and spin in a way that does not make you dizzy. a. In the morning, at a fixed time, e.g. at 8 O’clock, make 2 spins. Do not make any speed and spin in a way that does not make you dizzy. b. In the afternoon, at a fixed time, e.g. at 13 O’clock, make 2 spins. Do not make any speed and spin in a way that does not make you dizzy. c. In the evening, at a fixed time, e.g. at 21 O’clock, make 2 spins. Do not make any speed and spin in a way that does not make you dizzy. You have to add 1 spin each day, until you reach day 40.